If you’re a dog owner, you’ve no doubt dealt with a bout of doggie diarrhea at one point or another. Vets usually recommend a bland diet–boiled chicken and rice–but this may not be suitable for or even the best remedy for all pets. 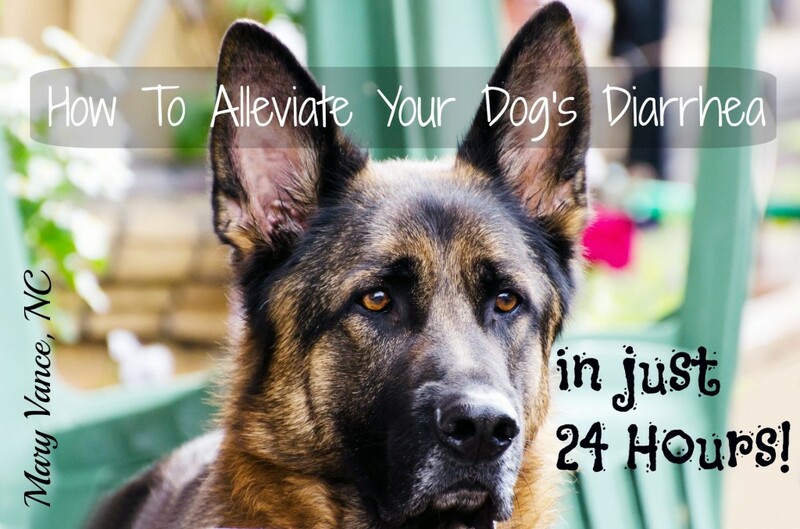 A quick internet search will probably yield you a million confusing suggestions, so I’ll keep it simple for you by sharing my tried and true 24 hour cure for occasional dog diarrhea. Before we begin, a couple of caveats: I am NOT a vet. I have been studying and successfully applying holistic animal care to my dogs and horses for more than half my life, but that doesn’t make me a vet, if that matters to you. Secondly, the recommendations in this article apply to the canine species only, not cats. Sorry cat people, I’m more of a dog lady. Thirdly, the recommendations in this post are applicable for occasional diarrhea, not chronic and continuing. If your dog’s diarrhea persists longer than 2 days or comes in frequent bouts, consult a holistic vet. My dog Shaia, the adorable labradoodle pictured with me in the right sidebar there, suffered repeated bouts of diarrhea as a puppy, and although the longterm treatment involved my finding her ideal diet + repairing her digestive tract, I learned a lot about diarrhea along the way. Lucky me! (Click here for my recommendations about what to feed your dog). Shaia had a few food allergies (probably a result of taking multiple rounds of antibiotics as a puppy) coupled with the tendency to eat anything and everything in site. And junk is plentiful in city parks and on sidewalks where she grew up, let me tell you. “Leave it!” is my most often used command. She’d get the runs anytime she ate chicken, other dogs’ food, cat food, or any assorted disgusting treats/stale pizza off the street. When something irritates the gut–the small or large intestine–regulated bowel movements (peristalsis) increase in speed. The body is attempting to expel the irritant or toxin, so transit through the bowel speeds up. Contents of the intestines move at a much faster rate, which doesn’t allow for normal removal of fluid from the bowel, and diarrhea results. This isn’t a bad reaction (though it’s pretty unpleasant for you and your dog): if your dog ingests a toxin of some sort, the body is doing its job in expelling it rapidly. This is why I don’t recommend PeptoBismol or KaoPectate, which will certainly stop your dog up but will delay release of offending agent. eating too much protein or fat-rich food (I once fed Shaia too much fat skimmed off the top of the bone broth and that caused the runs. Getting into the cat’s food will do it too). parasites (giardia is common in dogs). If your dog seems to get diarrhea on a regular basis (say, every 3 weeks), bring a stool sample into your vet’s office to check for parasites. IBS or IBD causes chronic diarrhea. Of course, some dogs have iron stomachs and can eat anything and be fine. My dog certainly is not one of those. First off, pull your dog off his food as soon as you notice the runs. Fast him from his normal diet for about 12 hours, but do NOT withhold water. During this time, make a batch of bone broth and give him that 2-3 times daily mixed with a powdered probiotic. (Don’t worry if you can’t make it; you can buy excellent quality bone broth here!) The broth is excellent for the minerals that can be depleted when your dog gets diarrhea. Make sure he stays well hydrated. NOTE: if your dog is diabetic, don’t fast him. Check with your vet. If you don’t have broth on hand or don’t have time to make it, you can get chicken or beef stock from the store, but it’s not nearly as mineral-rich. If you have some seaweed on hand (and who doesn’t really? ), grind that up and add it. Because I’m super crunchy, I always have kelp or some kind of sea vegetable in my pantry for broths and soups. The next morning, instead of regular kibble or your dog’s usual diet, make him a mix of pumpkin and browned ground turkey or lower fat ground beef (higher fat content is irritating to sensitive guts). You can use mashed sweet potato too. Pumpkin is very soothing to the GI tract and feeds the good bacteria. It’s a great source of fiber to help bulk up stool. My dog doesn’t do well with chicken or turkey, so I use ground beef, lamb, or you could use fish too. How much you feed depends on the size of your dog. Add powdered or ground probiotic. IMPORTANT: too much pumpkin can actually cause diarrhea (because of the fiber), so don’t overdo it: 1-2 tbsp per feeding for large dogs and 1-2 tsp per feeding for small dogs. Give him the pumpkin/ground meat meal with probiotic twice the day after you fasted (brothed) your dog. The diarrhea should be resolved on this day. Sometimes he will be constipated for a day or 2 after a diarrhea bout, so continue with the probiotic and pumpkin for a few days after if need be. Pumpkin works great for constipation too. You can add a little white rice to this mixture if your dog does well with grain, but grains can be irritants for some dogs. My dog does well on rice. You can also give enzymes to help break down toxins or remnants of whatever he ate. If your dog has a sensitive GI tract or farts a lot, consider giving enzymes and probiotic daily in his food, and also experiment with the best diet. It’s possible the gastic upset is due to too much protein from a grain free diet (some dogs do well with a little non-irritating grain like rice or oatmeal), or he may need a chicken-free protein. Some vets suggest having slippery elm on hand. You can offer about a half a teaspoon or a capsule for each 10 pounds of body weight with every bland meal (source). You can also give your dog powdered glutamine, which is very healing to the digestive tract, but don’t feed that long-term. Beta carotene isn’t the problem. Beta carotene is converted to vitamin A, which can be toxic to dogs in high doses, but it’s virtually impossible to achieve this toxicity via real food: “The toxic dose of vitamin A for dogs has been set at between 2,500 and 113,600 IU per pound of food, but only if this elevated level of vitamin A is fed to a dog daily for months or even years.” It’s good to use pumpkin in small doses so it doesn’t cause further GI upset, but it would be difficult to poison your dog with it. Unfortunately, due to our negligence, our dog got into the cat food and had herself a feast. This resulted in diarrhea all night last night, two empty bottles of 409 and a few remaining squares on a roll of paper towels. We’ve begun fasting (while making sure she has plenty of water), but knows she needs to have something substantial soon to get her digestive system back on the right track. I read your article which has some useful information, but I was also confused by the 50/50 pumpkin and ground turkey mixture. Our puppy is a 6 year old, 65 pound mutt…do your instructions mean 2 tablespoons of pumpkin and two tablespoons of ground turkey for her first meal? Or 2 tablespoons of pumpkin mixed into the ground turkey? How much turkey for her first meal? I don’t want to overwhelm her system already. Yikes, I know what that is like. Sorry for the confusion: 50-50 doesn’t mean exact ratios, just that it should be partly composed of ground meat and part pumpkin. Use 2tbsp pumpkin and about a cup of ground meat for that size. You can also do unseasoned ground turkey or ground beef and rice, 1 cup of each. The general information here sounds reasonable to me, but I need some specifics. My vet has always recommended giving the same overall daily amount of the alternative “sick puppy” food mixture as the daily amount of kibble our dog usually eats. Is that what you’re suggesting here? For our black mouth cur, that would be 1 C per meal 3x daily. Is that the same premise for the broth–given int he same amounts as a regular daily feeding? If not, how would I estimate the right amount for my dog (approx. 70 lbs.)? Couple things (if I understand your question): you want to fast them for 12-24 hours and do the bone broth and probiotics during this time. Then give the regular amount of rice/meat/pumpkin they’d otherwise get. I don’t have a formula; I just eyeball it. So if your dog gets a cup of food, just sub in the rice mixture instead. for the broth, do you boil a marrow bone in a big pot of water? You mentioned ground turkey so, how about telling us if it’s cooked or boiled! I brown it in a skillet. When you say to make a batch of bone broth and give it 2-3 times a day — about how much broth should I give at every serving? Depends on dog size. I use it as a delivery for probiotics during the fasting phase, and if they like it, a cup or so per serving is fine for a medium-large dog. Great suggestion, Marilyn. I’ll look into that. My vet told me with my medium sized dog to fast one day then give chicken and rice. That didn’t work. I tried pumpkin, he wouldn’t eat it until I mixed in Tracey. Now about 2 weeks later my elderly small dog has diarrhea but of course over Christmas everything was closed. Then I forgot to buy pumpkin today, (Dec 26th) I didn’t have chicken on hand , being I’m a vegetarian, so on Christmas I have her rice, she barely ate any, but a dog I’m dog sitting ate all of the rice when my teenage son let her upstairs where I was trying to separate food. Her stool is always soft so who knows. Ironically before I had my friends dog about 3 weeks ago she had diarrhea. The vet claimed this isn’t contagious, but another friend said her dog got diarrhea a few days after she was at my house when my 1st dog was ill. This all seems odd to me. Anyhow, I have fasted her 24 hrs, then gave her plain rice which she barely ate. She still has the diarrhea but I forgot the pumpkin in my running around so I gave her a 1/4 Or her normal serving of food, is that ok? I wasn’t sure but I don’t want her starving either…. What can I substitute to wrap pills around to mask the taste? Is Velvetta, in small bits alright? If it’s a probiotic, I break it open and sprinkle on food. Lewis my 5yrs Labrador/Bullmastiff has had diorreah in last 6hours.Hes never had the runs like this before.Once or twice after having a new food he has had slight soft pop.Hes a rescue dog that came into our lives at 1& a half yrs.Hes an inside live with the family boy & he actually had an accident on the balcony early evening before dinner time.Poor boy has never had an accident inside to date.He was a dream to toilet train, he lets us know he wants to go out.A not normal HUGE pop of a light fawn/beige colour.Boys took him out for 30mins or so & he went same twice.I took him for walk later & he went 3 times over 50 mins.Ive got 6 kids from 24oldest to 10youngest so instinctivley I didnt fed him dinner & feel hes go an upset stomach.We know alot about what dogs can cant eat & kids are always reaserching how dogs live/behave in their pack/family.He us a very fussy eater & cant have bones as he vomits within a half hour of having any sort of bone to chew on,even a raw chicken wing!His vet says dont give him his digestive system doesnt like them.I will do the broth suggestion for 24 hours.He loves rice & chicken shall I just do once a day or still twice still?As in his breakfast? Jodie, you probably need to keep him on probiotics and enzymes longterm (you can add to his food; I link to what I recommend in the post) and potentially feed him grain free lamb-based meals or lamb and rice, which are easier to digest than other proteins. Aside from that, you can keep him on rice and chicken with bone broth (I add the broth to the rice and chicken mixture) until it clears up. My 75 lb Border Collie (Yes, he is a big guy), got into a lot of cat food and has had the runs most of the day, and I just saw this post. I am going to put up his Kibbles and Bits and try a Chicken Broth as he likes chicken, but how much probiotic should I put in it? Hi Kim, i use about half of the dose that would be appropriate for humans on an ongoing basis and a full human dose when they have diarrhea. I’m rather shocked to see that you recommend adding both garlic in the onion to the bone broth for a dog. Both garlic and onion are members of the Allium family and a toxic to dogs but not people. If your dog accidentally in just a small amount of either one it may be OK, but adding it to their diet intentionally could have quite serious effects. I don’t recommend using onion and onion; it’s just my recipe for the bone broth. You can leave the alliums out. Hi Mary, I have a 4 month old puppy. She’s a rescue from Puerto Rico. I have had diarrhea issues with her since a few days after I got her from the foster. My vet tested her stool 3 times. All negative for worms and parasites. The vet put her on 2 different prescription foods, neither worked. I put her on white rice/boiled ground chicken and a little pumpkin, plus carrots as treats. This helped her right away,. The problem is that my vet says this cannot be her ongoing diet. I then added a probiotic and vitamin. The vet said it’s still not nutritious enough. He said I have to bring her to an internal medicine doctor, that she may have an exotic parasite. He says she’s too young for allergies. He also said she’s the one dog he hasn’t been able to treat for diarrhea… in all of his years in practice. I don’t know what to think, I feel like he refuses to think outside the box. However, I am worried about my puppy. She is growing but she still looks skinny. Her diarrhea on all of the dog foods I tried was terrible. 10-12x a day, 2-3x up st night. I was so happy the chicken and rice worked that now she’s been on it 3 weeks. Any thoughts? then switch her to a kibble. Also be sure to provide comfort and support, e.g. not leaving her alone for long periods, making sure she is well socialized and has toys, a space or a crate to herself, and a regular routine. Good luck and let us know how she improves!